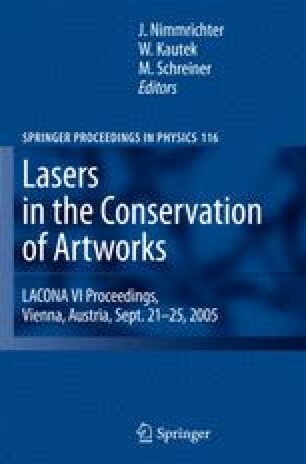 The aim of this investigation and conservation study was to examine and evaluate the laser ablation method as a practical technique for cleaning of Indiana limestone, a calcite-cemented stone widely used in historic structures throughout the United States. To this goal, a thorough petrographic characterization of the samples was performed prior to and following laser cleaning tests by Q-switched and short free running Nd:YAG lasers. The main optimization problem was the amber-gray appearance associated with the laser ablation by Q-switching lasers. Following the evaluation of such a cleaning result, two practicable solutions based on suitable pulse duration or wavelength selections were successfully demonstrated and then compared with different intervention protocols proposed. This chapter will show that through this case study, an understanding of effective uses of cleaning highly weathered Indiana limestone through the use of three types of Q-switched and short free running Nd:YAG lasers can be most effective in the removal from limestone of surface soiling and thick built-up carbon deposits ranging from 0.5 to 1mm in thickness. Case study evaluation methods included petrographic examination of composition, texture, and microstructure using optical microscopy and scanning electron microscopy performed on thin and polished sections of limestone sampled from six areas before and after cleaning. The microscopy studies were supplemented with energy-dispersive X-ray spectroscopy to characterize crystalline phases and track changes in chemistry.